It was a man’s voice. I was sifting through birthday cards at the drugstore, and it took a moment for me to realize he was speaking to me. “Excuse me?” I said politely. “Did you lose the bet with your husband?” He nodded at me, looking at the words on my t-shirt. 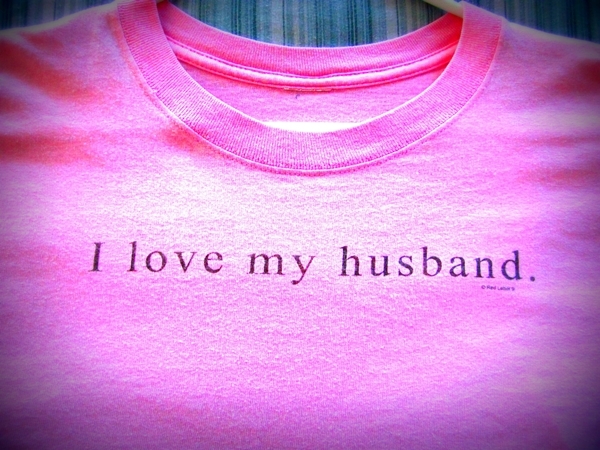 Emblazoned in simple, black lettering on the front of the pink shirt: I love my husband. Another time, I had a nurse who was taking my blood pressure say, “That’s an interesting shirt. What does it say on the back?” He was thinking maybe that there was a snarky retort on the reverse…a zinger. I’d bought the pink t-shirt it at a bookstore several years ago when My Beloved and I were newlyweds. I had never been in love in the all-encompassing way that I loved him, and had never really expected to be. That head-over-heels-ness was for other people, I’d thought. But God had other, better plans. It’s the second marriage for each of us; not quite a May-December union, but possibly a June-September one, in that we were older and – if not wiser – more in tuned with God. We actually did meet in church, and there was chemistry right away. But there was sanity, too – and that was a new wrinkle in relationships on my part. As we fell in love more deeply, it became apparent that we were meant to be married. But because we had both failed at our previous marriages, we decided to do something differently. We made a conscious and verbal decision not to make our marriage about ourselves – or even about each other. Making marriage about the other person is like making salvation about religion. It’s the relationship that really matters. From the very start, we agreed to consider our marriage as a triangle of sorts, with God sitting at the top and he and I on the bottom corners, looking up. The “circle of trust” may be important, but the Triangle of Marriage keeps us in check. In the years since My Beloved married me, reality has moved in and made itself at home, as is inevitable. With the blending of three teen daughters came epic drama in the household. With reality came economic ups and downs, health issues and challenges of getting older. We are two very imperfect people, in love with each other and with God. And sometimes we disagree, and have to check our positions in the triangle of relationship and remember who is in the Highest Place of honor. So, come to think of it….maybe I do wear the t-shirt because I lost a bet. I happily and gratefully lost a bet with God. Before marrying my husband. I had staked my understanding of the future on my own past failure in marriage. I couldn’t make it work, so I was doomed to be alone (or worse, repeat the cycle). But God had other, better plans that are not dependent on my failures or successes. “For God so loved the world that he gave his one and only Son, that whoever believes in him shall not perish but have eternal life.” – John 3:16. We are His Beloveds, and He is head-over-heels for us. It is mind blowing that the God of the Universe is head over heals in love with us…but it is true. As true as your love for your husband and my love for my husband. Wait! That’s not right. It’s truer because it is not tainted by any past regret, any fear, or hidden shame. It’s just the purest form of love. The source. May the love of God continue to be the source, the fuel, the example for us ladies in love. Until death do us part and beyond. Thanks, sweet friend. You’re right – God’s love for us is completely untainted and pure, free of the insecurity we bring as baggage. Love to you. You are welcome. Hope you have a great day! I’m going to bed so full of good stuff. Just read Andy’s post and it was wonderful. Now this! I love it, Jana. Every word is so true. Yep, God is the answer to our imperfect marriages, lives, and looney habits. And a triangular marriage is the visual I needed for 2013. Thank you. Thanks so much, Kim. Hugs and prayers for blessings on your triangular marriage for 2013! So happy to see where you are in your marriage now!! !